Some months ago I wrote a blog post about a physics project I am involved in here at the University of Nottingham, led by Professor Philip Moriarty which we call for short: 3D printing with atoms. I am engaged with the project as a social scientist interested in examining how such difficult research is being carried out and also how it is communicated. As I said in the blog, Phil and I work with a script writer, Shey Hargreaves and an artist to create a graphic novel about the project and wider issues relating to science and society. For a variety of reasons, mainly bureaucracy, the artist on the project has changed between my last blog post and this one, and we are now collaborating with Charli Vince. The script is now finished after various rounds of revision and the artist is beginning her work illustrating it. Shey, Phil and I discussed the script several times. In the process, we discovered how difficult it actually is to talk about real, rather than speculative, nanoscience in ways that not only Phil, the natural scientist, Brigitte, the social scientist, and Shey, the writer understood and to come up with ways of ‘making science public’ that would ‘work’. We struggled in particular with explanations of particle/wave duality and quantum tunnelling and the choice of an appropriate mathematical equation. The script is called ‘Open Day’. There are two central characters, Radhika, a PhD student in nanoscience, and Kim, an intruder who turns out to be curious about nanoscience, and in fact in all things science. There are also two peripheral characters, namely Tim, Radhika’s colleague, and a quantum cat that weaves the science and the personal narratives together throughout the script. I like that cat and I am really looking forward to the illustrations. opens the sandwich and starts eating. The scanner is the precious scanning probe microscope that Radhika uses for her research. The stand-off between Radhika and Kim, between the spanner and the scanner, is however more than just a ploy to make Radhika talk about 3D printing with atoms. They also ‘confront’ other issues in their night together, such as sharing science with others, the scientific method (“Radhika: Bashing something till it works is an age-old part of the scientific method”), women in science, access to university education, motivation and frustration and much more. right down to the atomic level. it’s clean and ready to use. Again, I can’t wait for the illustrations. We hope to publish the graphic novel soon, and I’ll let you know when it’s out. I hope you will enjoy it as much as I do! I also hope the few extracts in this blog post have whetted your appetite. If you wonder what the image we have chosen is…. It’s not some holes in brown fabric! 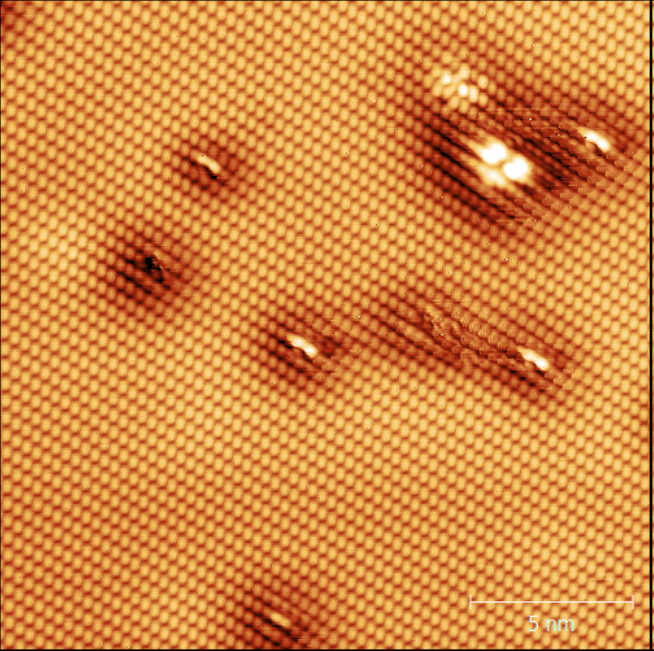 What you are seeing are rows of atoms at the GaAs surface which the team are using in their experiments. GaAs is gallium arsenide, a compound semiconductor. However, I became a bit Kim-like and asked Phil a number of questions. We hope to do a video related to our GaAs experiments at some time in the not-too-distant future for Sixty Symbols (Brady Haran willing), and involve Filipe Junqueira who produced our first atomic resolution images of GaAs(110)!